India Ink - Beer Camp #42 | Sierra Nevada Brewing Co. Draft service into a balloon goblet at Selma's in Rancho Santa Margarita. According to the menu listing, the abv is 7.5%. A: Opaque black color that transmits clear, dark brown at the periphery; over two fingers of light beige foam collapses to a thick, persistent pad. Heavy lacing remains, showing as regular increments on the glass. S: Dark toast and herbaceous green plant stems are most prominent in this mild-smelling beer that also shows some clean notes of charcoal. T: Begins off-dry, with balanced roasted grain and citrusy, herbaceous hop aromatics that remain understated in flavor. The lack of powerful hop flavors are made up for by the restrained nature of the acidity, which is extremely well-behaved here. The middle dries out almost entirely as bitterness surges to a moderate level through the finish that is both slightly smoky and spirituous . M: Thin to medium viscosity, extremely smooth on the palate due to eminent creaminess and a slight acidic bite, with low carbonation. D: Ooh, another Beer Camp beer to try. I cannot help but compare this to the last product of beer camp that I had the opportunity to sample--the excellent Blackbird black IPA. While Blackbird was a roasty and strong imperial contribution to the style, this beer is more moderate in its approach. Low acidity and a remarkably smooth texture, coupled with balanced, less-intense flavors, make this effortless to keep returning to--despite the fairly robust abv. As an heir to the most attractive qualities of Blackbird ale this beer is a remarkable success, and ends up being even more approachable in the bargain. If Sierra Nevada eventually puts one of these recipes into production, they would do well to preserve those qualities as well--starting with the heavenly texture. This beer couldn't make it to Western Mass fast enough from Chico, CA! The information on the keg indicated 7.7%, but you might think it's lower due to the ease of drinking. A: Very dark and almost completely black. The edges of the glass allowed a hint of light to be seen, but that's about it friends. India Ink left a shattered pattern of lace all the way down my half-liter pour, leaving evidence that this delicious beer once comforted the interior wall of the glass. S: Toasted and roasted grains with a delicate hop nose. Nothing overstated, but an appropriate introduction to the taste. T: As advertised by the nose, a balance of roasted/toasted flavors and citrus hops. A very subtle rye dryness, but enough to add another layer to this well composed song. M: I described this as IPA meets schwarzbier with few disagreements. The appearance is heavy, but the mouthfeel is moderate, creamy, and smooth. O: This is a win for sure. Hopefully this one can transcend Beer Camp and make its way into the Sierra lineup as a seasonal offering (or more!). It's simply too good to be a one-off production. On-tap 4/27/2011 at Doherty’s East Ave Irish Pub, served in a US tumbler pint glass. A: The beer is a deep black color, large beige head that fades slowly and leaves a thick lace on the glass. S: The aroma contains roasted malts, floral hops, citrus and chocolate. T: The taste starts out with a hearty roasted malt character that is quickly followed by sweet flavors of chocolate, citrus and caramel. Then a strong hops bitterness comes in to create a good balance. The after-taste is slightly hoppy and bitter-sweet. D: Tasty, goes down very easily, not too filling, good kick, very good representation of style, this is a very nice black ale to drink for a long time. taste was nice...big mouthfeel with a roastiness and a great bitter finish. A- Pours very black, almost stout looking with a big, fat, toffee colored head that's very slow to recede. S- Spicy, piney hop character. A bit of roasty and honey like sweetness, very nice contrast. T/M- Smooth and subtle, but pronounced, roasty malt flavors of sweet cocoa and a slight roasted astringency upfront. Again I get a fleeting note of honey like sweetness which is very interesting. The Rye graininess and spice is a nice lead into the fruity, hoppy finish. An interesting passionfruit like and mildly drying, slightly floral/citrus hop character. The hops are prevalent, but understated, rather than raw and in your face. The feel is surprisingly not thick whatsoever, medium light in fact. Considering the dark malt bill I thought it'd be a bit heftier, but it lends to some pretty easy quaffing for such a tasty brew. O- A very drinkable BIPA and a nice take on the style that has mass appeal. Instead of just throwing a bunch of roasted malt and hops together they really thought this one out and it comes together quite nicely. Well it's definietly black for one. Nose has a subtle roastiness and a big plume of zesty New Zealand hops (Motueka). Taste is a very nice balance of dark chocolate with a hint of spice (From the inclusion of rye malt). Hops are definietely there, also earthy and spicy. No way this tastes 7.7%. Mouthfeel is a little more full bodied than you may expect from such a big hop profile so it's clearly its not just dehusked carafa malt in here. Overall it's a really good take on the style and the rye malt is an excellent bridge between the black and the ipa elements of it. I had this a few weeks ago and lost my notes. I found the notes today, so here we go. Poured into straight pint glass. Poured a translucent black with about 1/4 inch of dark beige head that had medium retention and light lacing. The aroma had hops upfront, but they were quickly overtaken by the roast notes. The flavor had a nice crisp hop presence that wasn't overwhelmed by the roasted malts. The body was on the thin side of average for the style. Drinkability was good, but this isn't among my favorite styles so I can't see having more that the one. Overall, this was a pretty average take on a style I find to be something of a red-headed step-child. Go ahead and try one, it's not terrible. Hell yes! This beer pours out as a deep black color with just a minimal red highlight. The head is tan and much thicker than I expected, this beer has a great lacing. The taste is hoppy and roasted really well balanced. The mouthfeel is thick and nicely carbonated. Overall it's a killer black IPA, very enjoyable brew. A: Very dark color. Thick tan head that reduces with sitting time but leaves a nice lace. S: Aroma of roasted malts, spicy hops, and chocolate. T: Very roasty on the start, fading through the rye to chocolate and caramel. Then the hop bitterness balances everything out, leaving piney hops and roasted malts to linger. O: Black ales are not my favorite style, but that said, this one is good, easy to drink, and easier to order another. Nice alcohol kick too.. Pours nearly pitch black with a light mocha head and lots of sticky lacing. The smell is of hops, malt sweetness, coffee, and chocolate. The taste is hopy with just a touch of mocha and coffe at the finish. The mouthfeel is medium bodied. Over all, one of my favorite beer camps offerings. Would love to see this year round and in six packs. 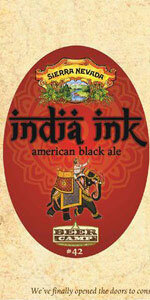 India Ink - Beer Camp #42 from Sierra Nevada Brewing Co.